The Black Gundam 2 марта 1985 г. Departure 9 марта 1985 г. Inside the Capsule 16 марта 1985 г.
Emma's Decision 23 марта 1985 г. Father and Son 30 марта 1985 г. To Earth 6 апреля 1985 г. Escape from Side One 13 апреля 1985 г. The Dark Side of the Moon 20 апреля 1985 г. A New Bond 27 апреля 1985 г.
Reunion 4 мая 1985 г. Entering the Atmosphere 11 мая 1985 г. The Winds of Jaburo 25 мая 1985 г. Shuttle Launch 1 июня 1985 г.
Amuro Flies Again 8 июня 1985 г.
Katz's Sortie 15 июня 1985 г. Through the Haze of Darkness 22 июня 1985 г.
Hong Kong City 29 июня 1985 г.
Mirai Captured 6 июля 1985 г.
Cinderella Four 13 июля 1985 г. The Heated Escape 20 июля 1985 г. A Sign of Zeta 27 июля 1985 г. The Eyes of Scirocco 3 августа 1985 г. Moon Attack 10 августа 1985 г.
Counterattack 17 августа 1985 г. Colony Drop 24 августа 1985 г. 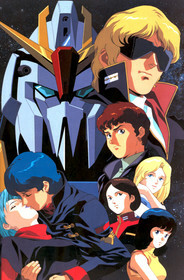 The Ghost of Zeon 31 августа 1985 г.
Rendezvous With Char 7 сентября 1985 г. The Jupitris Infiltration 14 сентября 1985 г. Crisis at Side Two 21 сентября 1985 г.
Jerid's Desperate Attack 28 сентября 1985 г. Half Moon Love 5 октября 1985 г. Unidentified Mobile Suits 12 октября 1985 г. The Messenger from Axis 19 октября 1985 г. The Call of Darkness 26 октября 1985 г. Storm Over Kilimanjaro 2 ноября 1985 г. Forever Four 9 ноября 1985 г. The Day of Dakar 16 ноября 1985 г.
Reccoa's Shadow 23 ноября 1985 г. By the Lake 30 ноября 1985 г.
Activation of Gryps 7 декабря 1985 г. Awakening 14 декабря 1985 г.
Goodbye, Rosammy 21 декабря 1985 г.
Haman's Victory 4 января 1986 г. The Gate of Zedan 11 января 1986 г. Coming From the Heavens 18 января 1986 г.
Scirocco Rises 25 января 1986 г. A Descent Into the Maelstrom 1 февраля 1986 г. The Mirror of Rosamia 8 февраля 1986 г. Casualties of War 15 февраля 1986 г.
Riders in the Skies 22 февраля 1986 г.